I've been keeping an eye on some of the collections shown so far at London Fashion week, and I can definitely say I'm not disappointed! Betty Jackson's floral pieces in understated tones are so beautiful. I also liked the more architectural items (the jackets!) There are only two times a year when I wish that my budget could stretch to such crafted clothing. 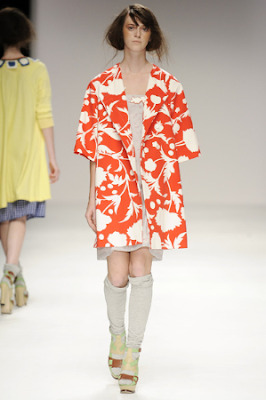 I felt that this particular collection did have a very quintessentially british feel. (maybe all the ankle socks?) I don't think I saw one undesirable piece. Nicole Farhi's laid back mix of masculine tailoring and opulent shades was another favourite. (and as with Betty Jackson- the jackets!) The varying shirt dresses have really inspired me. I think I may have to do a DIY version soon! Loved the use of pockets too, especially to create interesting lines on the fabric. I am definitely a pocket person! I only discovered Eley Kishimoto recently, and I'm so glad I did! The dazzling array of prints and patterns shown, combined with sophisticated grey was gorgeous. I liked the cut of certain pieces too, making even the shape appealing. And I'm not even sure if I can sum up the amazing-ness (is that even a word?) of Vivienne Westwood Red Label. As I've already mentioned, I am somewhat of a fan of Ms Westwood. (and jealous of Nicky who got to see her cycling past!) I think she could singlehandedly be credited in engaging my interest in fashion. When I was 10 I made a westwood-esque punk dress out of an old baggy t-shirt complete with rips and safety pins! Not exactly high fashion, but you have to start somewhere. Anyway, the pyjama shirt pattern and shape inall it's various guises worked particularly well. And there was some skilled drapery going on as well. Plus the jackets. (Yes I'm obsessed withjacktes this season- I have realised! But hers are particularly perfect.) And have I mentioned that floral rose print? Okay, time for me to stop wittering. This post could basically be christened "My love of Vivienne Westwood" but it isn't.. The other show I'm really looking forward to seeing (on the internet obviously- although if there are any free tickets going then please notify me!) is Burberry Prorsum. Actually, Christopher Bailey is one of my favourite designers. So classic, and british-ly quirky. And having actually been to the Burberry house just reinforced my admiration! And to get my hands on one of those trench coats.. Haaha. I'm doing a post tomorrow on a little shoot I did over the weekend, but I thought it would make a nice change to post some observations rather than just pictures of me. So see you then! Lovely photos! I love the jackets too!!! That orange jacket is amazingg! That first pic is so lovely, hehe I like pictures of you they are cute! judging from what i've seen you wearing here, all of these looks would be divine on you. 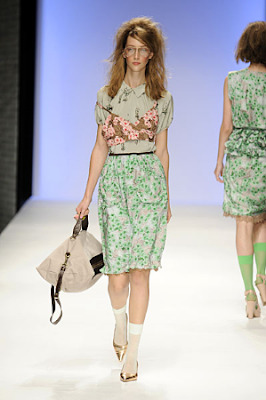 some of the cuts, and definitely the prints, have a vintage feel. that first outfit is really quirky but so femme. it's probably my favorite here. The green jacket is great!!! Oh, wow, Roz, I can't wait to properly sit down and read this post. And now I want to take a look at Betty Jackson's whole collection. I agree with my friend Style Odyssey: you've chosen outfits you'd look great in, which is the mark of a true style icon.